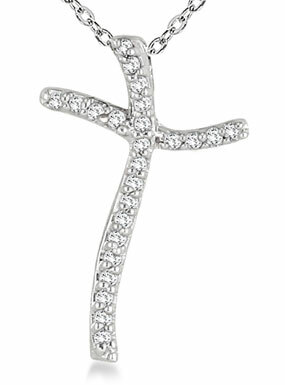 This polished white gold cross is a dream to wear with its sleek, contemporary design and beautiful message of faith. The 1/10 Carat Diamond Curved-Cross Pendant in 10K White Gold is a stylish piece that can be worn each day, if desired, letting those around you admire its shimmering quality. The piece features two slightly curved lines that work together to form the unmistakable holy image of a cross. Each line holds a stunning display of round white diamonds (0.12 t.c.w.) that work together to absorb the light and shimmer from within. A chain attaches by way of a hidden bale at the back top of the cross. This diamond curved-cross pendant is a fashionable piece that provides a way for you to celebrate your faith in a modern way. Plus, the quality 10K white gold and white diamonds make it something special to treasure and admire for years to come. Pendant comes with an 18 inch white gold cable chain. We guarantee our 1/10 Carat Diamond Curved Cross Pendant in 10K White Gold to be high quality, authentic jewelry, as described above.